Another therapist told me about this quote and I started thinking about how we listen. Invariably we want to give advice and make a person’s problems go away. Very often this is not what the person needs. Sometimes one of the most powerful tools to help another person is to just listen without judgment or the intent to solve their problem. This is a gift and we rarely do that for one another. This gift of listening really helps the other person feel like they are truly being seen and heard. I can see this more clearly now as I reflect on my relationship with my parents before their deaths. I remember with my Mother that I listened with the intent of fixing things for her. I look back now and realize that she just needed to be heard. This also reminds me of situations when my Dad complained about my Mother’s Alzheimer’s and my reaction was to jump in and want find solutions to her deterioration. There are times when we just need to process our thoughts and feelings, and when someone listens it gives us the space to fully express ourselves. This process takes time and we don’t often feel like we have the time or are allowed to make the time. 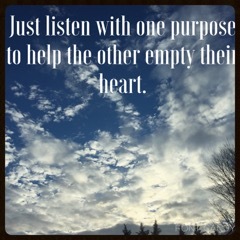 Make a conscious effort to try this with a friend and really listen. See if this makes a difference in your own life. When you see the value of stopping and listening, it can remind you that you have the same need in your own life.